Traveling mailbox are not the biggest player in the virtual mailbox arena, however the service has accumulated quite a following over recent years. That being said, whether you are small business owner looking for a virtual address, or maybe even an expat that requires a virtual mailbox service while away from home, is Traveling Mailbox the service to go for? Note: Vault50 has also published a virtual mailbox service comparison here. This profiles some of the competing mailbox services in the space. Traveling Mailbox did come up as the number 1 pick. Before I dive into my report on Traveling Mailbox it makes sense to quickly provide an overview on what a virtual mailbox services (VMS) does. First and foremost, a VMS gives you a physical address that is removed from your home or work address. This is where the service is especially useful for freelancers that do not want business mail sent to their home address, or travellers / expats that do not actually have access to their permanent address. You can direct all your mail to the address provided by the service. In circumstances where mail has to be signed for, a service such as Traveling Mailbox has a person physically present who can do that for you. What does a virtual mailbox service do? Beyond providing you with a ‘virtual’ physical address where mail can be sent and signed for, a VMS is beneficial in many other ways too. After the mail has arrived at the VMS, a provider such as Traveling Mailbox will alert you to its arrival by scanning an image of the mail / package and emailing you. In cases where important mail such as bills, banking correspondence, (cards and statements) packages or government papers (if you really want your tax return documents), the VMS will premium post said mail to your given address. Traveling Mailbox (and other VMS’s like it) offer additional services such as check deposits, faxing, and delivery of virtual mail and notifications to compatible app services such as Evernote (I’ll cover this in greater detail within the review below). Opening mail that does not belong to you is a Federal criminal offence within the United States. So how does a Virtual Mailbox service function if this is the case? Upon signing up with a VMS you will be asked to authorize the provider to legally open your mail. The only way of doing this is via the USPS Form 1583. While filling this out is easy, having it notarized can be very inconvenient especially if you are already abroad and wish to set up the service. In steps online notarization now. If you cannot make it to a U.S. post office to have your 1583 form notarized, you can use an online notary service. This will enable you to have your documents legally notarized by an official notary via your webcam. This is a inexpensive way of setting everything up so that a service such as Traveling Mailbox can legally open your mail. (Editors Note: Vault50 will be covering some of the best online notary services in an up coming review, however NotaryCam, Notarize, and SafeDocs are 3 reputable options currently available). With an easy to use interface, automatic alerts and fast response times when taking requested action on your mail, Traveling Mailbox continues to take the stress out of dealing with correspondence while you live abroad. Business owners are well catered for too with the flexible Small Business Plan. I first started using Traveling Mailbox in preparation for a stint living in the U.K, (a trip I am still enjoying in fact). I had used Earth Class Mail before, and while I had been happy with the service, I found the online interface a little too busy for my liking. Anyway, with the one-way ticket booked, (I was following my girlfriend back to England) and all the various stresses of preparing for living abroad, I was pleased that the issue of handling my mail was very easy to set up. Traveling Mailbox have been around for a long time and that is reflected on how their website is designed to give you what you need, without going for the hard sell. I like this approach, and I really was up and running in minutes. The package that I went provided the standard services any expat would ever need from a virtual mailbox service. The virtual address of course, with fast mail forwarding to any address in the world should you need the physical mail delivered to you. The package also included post mail scanning, mail storage, secure document shredding as well as mail filtering (to exclude junk mail). Another very useful part of the service as someone living abroad, (and wanted to avoid calling on family members to deal with certain issues) is the secure check deposit facility. For some one looking to use Traveling Mailbox for business purposes, you have a choice of business addresses as the face of your enterprise. One of benefits of using Traveling Mailbox that has impressed me a lot is the speed in which your documents are made accessible in the digital domain. These PDF scans can also be uploaded or downloaded from digital mail platforms such as your personal e-mails, the Evernote app, and other website portals of choice. The service also provide bulk scanning of mail via a ScanPAK bundle, (handy for businesses) with individual envelope scanning being done by the QuickScan application. A really cool feature and one that has helped me stay on top of my administration, is that the scanned PDF documents are fully searchable. The docs are processed through what is known as an OCR (Optical character recognition) software; finding what you need quickly is made very simple indeed. As I’ve mentioned, the Traveling Mailbox website is easy to navigate, and this level of intuitive design is there after you have logged in to your dashboard too. I have used every one of these options over the past year and each has been carried out quickly and efficiently. It is worth noting that if mail forwarding is chosen, you need to create a shipment profile for that particular item. Within your dashboard you can select how the item/s are packaged, when they are to be shipped, and if shipping insurance/tracking should be purchased. The Traveling Mailbox management platform also supports keyword tagging which makes keeping on top of things, (assuming you are diligent in creating the tags), nice and simple. These services can be also be accessed using the TravelingMailbox apps running on iOS or Android platforms. Related Content: An in depth look at iPostal1: Does it live up to the hype? As I have already mentioned, I opted for the Basic plan however there are 2 other plans available; the Extended plan, and the Small Business plan. All 3 plans come bundled with an online postal mailbox, mail forwarding services, and postal mail scanning. The main difference between the plans is the amount of scanning and forwarding you can access on any given month, (you can always upgrade if your mail volume increases however). The Extended and Business come with the ScanPAK bundle and fax services. Superior virtual mailbox service that includes online postal mailbox, post mail scanning, mail storage, secure document shredding, mail filtering, and secure check deposit services. Provides both standard and premium virtual addresses for business or residential use. Has 3 flexible subscription plans that are easy to change from one to the other based on your requirements and mail volume. Easy to use online interface for dealing with your mail, (online mail management portal). PDF documents are scanned in a manner that makes them easily searchable. Keyword tagging allows for efficient retrieval of digital copies. Supports digital mail integration with extrenal platforms such as Evernote and Drop Box. Cheaper that the main competitor in the virtual mailbox service space, (Earth Class Mail). The service itself lacks a dedicated API platform. 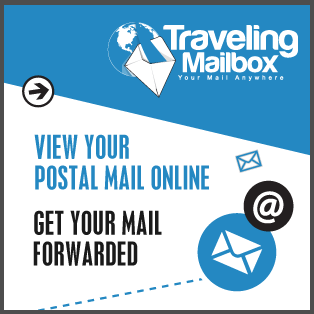 Traveling Mailbox is an excellent choice for those looking for a safe and convenient mail management system while living abroad. I know this first hand. Having the stress taking out of what mail and packages are arriving back in the U.S is a real bonus. If you are a small business owner and looking for a professional virtual address and a reliable service to manage your mail, Traveling Mailbox will most certainly fit the bill. Essentially, the service is designed to allow users to have global access to their mailbox using a paperless platform. Traveling Mailbox nails it in this regard. Highly recommended indeed.